Beautifully structured, bone dry, wild-foraged perry. A pretty nose of white flowers and sweet pastry leads to a firm, structured mid-palate with refreshing white tea flavors. Acid first, then tannin, limes, salt, and more white flowers on the finish. Pair this perry with crudités with goat cheese and hot peppers in oil. Until the phylloxera epidemic in the mid 19th century, wild grape seedlings were ubiquitous in France and Italy, which made the point, “grapes love it here.” That is the way it is here with wild pears. And there is no phylloxera-like pest to dampen our enthusiasm for this terrific cider base (although fireblight is eliminating the vulnerable). 2017 was another on-year for wild pears in our area. Within a 10-mile radius of our farm in Van Etten, New York, our friends Ben Khan and Akiva Silver harvested 8 tons of wild pears for our 100% wild seedling Perry Pear. Ben Khan, the mountain climber, was in his second year of studying the countryside and developing relationships with landowners who didn’t know about the treasure growing in their overgrown fields. He already knew the best trees and conscientiously monitored their ripeness through the fall. He brought us bags oozing with ripe pears. Akiva delivered his two tons in one or two loads from a few huge trees in the Finger Lakes National Forest. I remember marveling at the size of one of the varieties: as big as Mutsu apples. 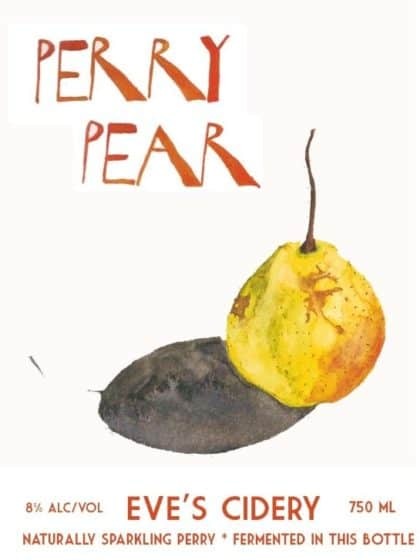 At the fresh end, biting into one of the seedling pears was an experience of the most intense tannins you have ever tasted. Now, after two fermentations and freshly disgorged, the cider is pretty, with perfect structure.